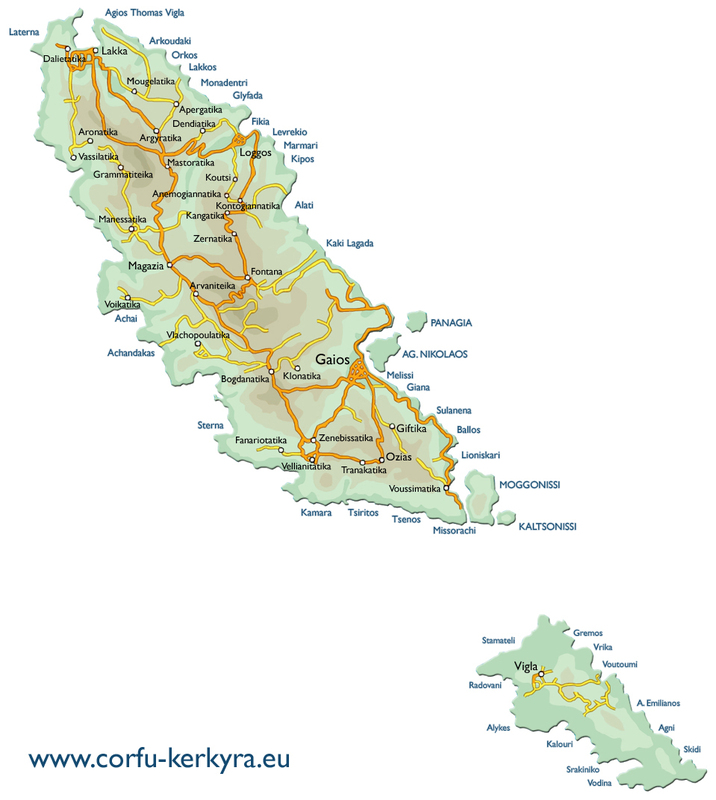 Paxi and Antipaxi with 2000 inhabitants represent the biggest islets set around Kerkyra island. They are placed south from Corfu island and you can reach them by an hydrofoil service or by a ferryboat that permit you to bring your vehicle. The hydrofoil and the ferryboat offer a daily service toward Paxi island, they leave from Lefkimni and they arrive to the port of Gaios in Paxi. Once in Paxi you can find every kind of services you need. Paxi is the biggest one and offers 3 big tourist villages: Gaios, Lakka and Loggos. The island of Paxi is the ideal place for those who love to sail. The few small ports in this island are always full of sailing boats and yachts. The west coast of Paxos island is more spectacular since it is full of sea caves and lonely beaches accessible only by boat. Just near Vasilatika village there is a lovely cave called Ipapandi and in this part of the coast the sea is really stunning. The east coast of Paxos island is mostly flat with several bays among which the main town and Orkos, Lakkos, Kipiadi in the photos below. South to Paxi there are two other small islands: Moggonisi and Kaltsionisi where there are the ruins date back to 1680 of the small church of Aghio Spiridon. Today Paxi depends mainly on tourism, fishing and olive oil production. The tourist villages where you can find an accommodation and tourist facilities are Gaios, Lakka to the north and Loggos. The main town is Gaios, a picturesque village with a lovely central square, a well equipped port and many cocktail bars where you can spend the night. Just in front of Gaios there are two small and green islets. The bigger one is A. Nikolaos with its Venetian fortress, while the smaller one is called Panaghia because there is the old church of Kimisi. Antipaxi is located just 2 nautical miles south from Paxi island and you can reach it both from Paxi or from Corfu. Antipaxi is more unspoilt and wild than Paxi, without massive tourism and with a really stunning sea. The inhabitants of Antipaxi are only about 20 and this number increases during the high season.